Why Go With Our Pane Washing? Benefit from of a reliable service in Stamford Hill that has received over 95% of positive client feedback! Q: How is your window cleaning Stamford Hill going to renew the clarity of my sills? Internal window treatment – The technicians will wash dirt with ladders and sponges. Q: Can you polish my panes during bad weather? A: If you spot dim clouds on the day of your booking, don't be upset. The window cleaners in Stamford Hill can still perform the service as long as they're facing a light shower. However, in the event of a rainstorm, we will kindly ask you to put off your appointment to avoid any mishaps. Q: Can I assist the specialists in any way? A: Yes, you can! The washing team will need a free parking space in close proximity to your building (30 metres or less) and on the same side of your windows. Q: Do I need to greet the experts in person? A: It's no problem for the team to rinse the outer surfaces of your glass façade as long as they are free to pass your front gates. And if smudges have landed on your inside surfaces as well, just let us know and we'll perform a free key pick-up and delivery. A: We will instantly inform you about the reason of the expert's delay and notify you once he parks near your building. A: Yes we're licensed to clean any type of window or window part. What's more, every PVC or UPVC frame or ledge will be treated for free! Q: What about stained glass windows? For the past ten years, our window cleaning Stamford Hill service has always delivered efficient results at the most fair prices in your region. You can browse our rates in our concise price table below. 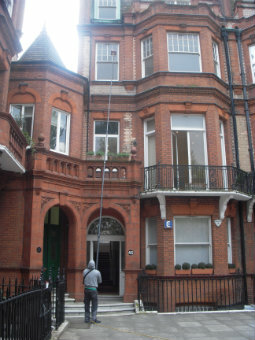 We've created our window cleaning in Stamford Hill with flexibility in mind. As a result, our service is now regularly booked by business and household customers alike. Let's go over our window cleaning alternatives on offer. With our outside cleaning, you can effortlessly polish the casements of any building with four or less storeys. The proven adepts will arrive in a cleaning van. The window cleaners in Stamford Hill will then link a convenient water-fed rod to the van's water storage. The special refined water will be ejected through a brush-head installment at the pole's end under high pressure. When the water disappears under the sun, your panes will stay smudge-free for weeks to come. For premises above the fourth storey, we'll send in veteran climbers for rope access window washing. Using proven ropes, cherry pickers, and ladders, they will assess and refresh any lofty commercial property over the course of one afternoon. Should you request risk appraisal reports, we'll gladly provide them for you. We also take our job very seriously and will follow all safety regulations. If your panes are muddy on the inside as well, the cleaners can offer interior cleaning with ladders and sponges. We are happy to announce that our window cleaning in Stamford Hill has been requested by several bordering districts as well. You can see which districts we operate in below. Another quick and easy way to get a free instant quote or to book window cleaning services Stamford Hill N16 is through our web site.